ANN ARBOR, Mich. - Goaltender Stefanos Lekkas tallied a career-high 48 saves, including 23 in the third period, as the Vermont Catamounts knocked off fourth-ranked Michigan to open the 2018-19 season at Yost Ice Arena. "I love how we came out to play tonight. On top of getting the two-goal lead, we used our speed and skill for some great plays," head coach Kevin Sneddon said. "Lekkas was the difference tonight, especially in the third period after getting into penalty trouble." - The Vermont power play struck just 1:31 into the season as Matt Alvaro and Liam Coughlin assisted on Alex Esposito's one-time goal from the slot. Just 2:29 later, Esposito potted his second with assists again coming from Alvaro and Coughlin. - Michigan's power play struck twice in less than a minute halfway through the first, with Will Lockwood scoring at 9:20 of the period and Nick Pastujov tallying a goal at 10:18 of the period. - Captain Matt O'Donnell broke the deadlock with less than five minutes left in the first. After his initial shot from the top of the circle was blocked, the California native regained the puck and fired one to the back of the net past Max Kaufman and Hayden Lavigne (19 saves). - A scoreless second period saw each one power play chance from Michigan and a pair from Vermont, with none finding the back of the net. - Lekkas recorded seven saves on Michigan's first power play of the third period after Jake Massie was sent off for cross-checking just over a minute into the frame. He tallied another six on Michigan's third power play of the period and sixth of the game. - The junior finished the third with 23 saves and the game with a career-high 48, his fifth career game with 40 or more saves. - Sophomores Martin Frechette and Vlad Dzhioshvili sealed the game with 2:21 remaining on a 2-on-1 rush out of the UVM zone. The Russian fed the puck to a streaking Frechette in the slot who fired the puck five-hole for the goal. It was the first career points for both Cats. 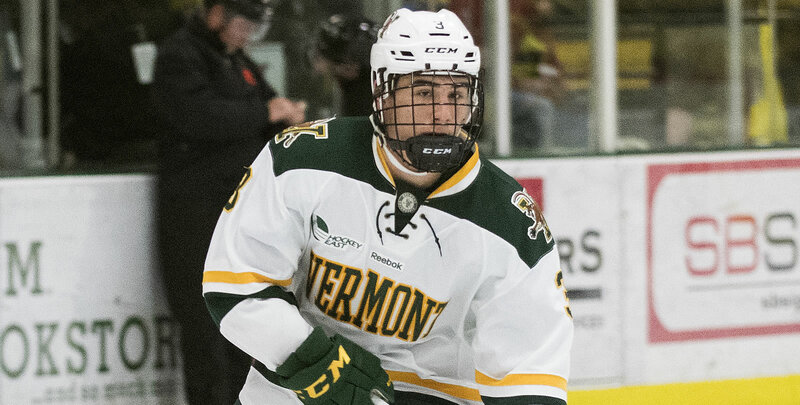 Vermont hosts a pair of games next week, starting with an exhibition against Laurentian next Thursday (Oct. 11). UVM plays its first regular season home game next Saturday (Oct. 13) with Quinnipiac visiting Gutterson Fieldhouse. Both games will begin at 7:05 p.m.